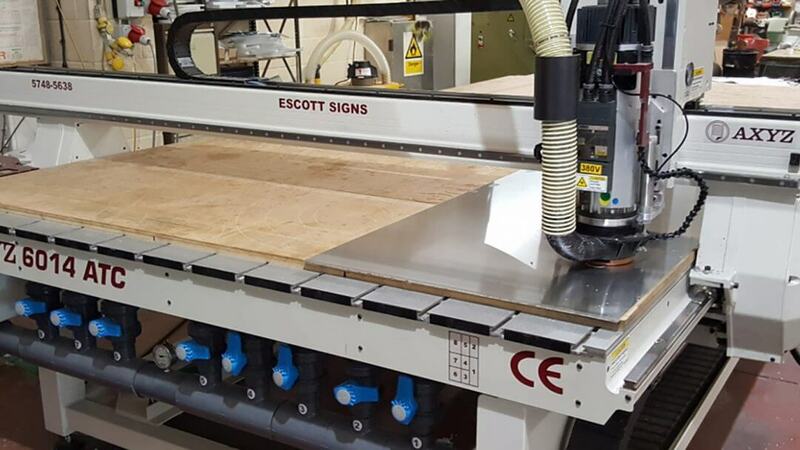 Gateshead, Tyne and Wear corporate ID and high street retail signage specialist, Escott Signs has upgraded to a large-format AXYZ CNC router supplied by AXYZ. Purchase of the new machine was facilitated by the generous trade-in discount given by AXYZ against an old Pacer router that no longer effectively met the requirements of the company’s rapidly expanding customer base. Established in 1986 by two managers from one of the UK’s largest sign manufacturers, with the aim of providing a high level of service but at a keenly competitive price, Escott Signs has evolved rapidly to become one of the most successful companies in the signage industry. The company operates out of a purpose-built facility located on the Team Valley Trading Estate in Gateshead, employing 40+ people and offering a full nationwide package from design through to manufacture, installation and ongoing maintenance and technical support. Installation is carried out by a team of directly-employed specialist installers. Part of the 6000 series of large-format routers, the 6014 machine now installed at Escott Signs incorporates the AXYZ ATC (Automatic Tool Change) facility and a special unit that enhances the router’s processing capabilities on aluminium, a material widely used in the sign industry for large exterior signage and associated building cladding applications. With its over-sized production bed, the router is also used to process a disparate range of associated sign-making materials such as acrylic, plastics and their derivatives, foamed sheet and timber. The 6014 is supported by ArtCAM design and production software that was also supplied by AXYZ. The 6000 series of large-format routers offers processing widths of up to 2159mm and lengths from 3048mm up to10 metres. In common with all AXYZ routers, the 6014 can be supplied with a raft of optional production tool enhancements. These include the AXYZ Auto Zone Management facility that ensures the material being processed is always held securely throughout the routing/cutting cycle and the latest A2MC machine control system with a massive memory capability for program storage as well as providing network connectivity for error-free program transfer. A further optional enhancement is the latest AXYZ helical rack and pinion drive system. This incorporates a multiple gear teeth configuration that helps spread the workload more evenly, leading to greater routing/cutting accuracy, faster throughput speeds, reduced material wastage and ultimately a longer than normal machine life. For information on the services provided by Escott Signs, visit www.escottsigns.com or telephone 0191 4871010.